SEE HIP YOUNG RAVERS SUCCUMB TO THE LURE OF THE EVIL WEED! WATCH THEM TURN INTO MIXED-UP FLESH-HUNGRY ZOMBIE CANNIBAL HOPHEADS WITH A LUST FOR BLOOD! RECOIL IN HORROR AS THE DOPE-FIEND PLAGUE SPREADS ACROSS THE COUNTRY! 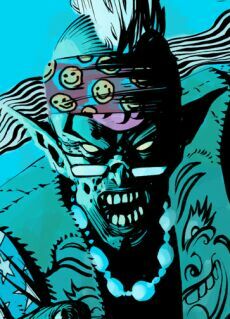 A stunning new one-off 2000AD comic strip reveals the true horror of dope-smoking, the stuff that all those beardy flower-wearing Jerry Garcia look-alikes don’t mention. 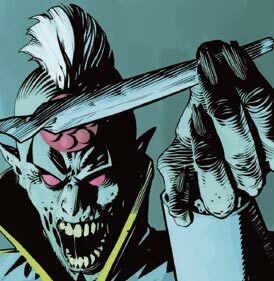 Yes, it’s TRUE (it must be, because we say so), even just one spliff can turn you into a crazed zombie cannibal with a deadly case of the munchies! ‘Reefer Madness’ appears in Prog 1263 of 2000AD, the Galaxy’s Greatest Comic, which hits the streets on 10 October. 1263 is a re-launch issue, featuring all new storylines, so it is a great point for new readers to start picking up the magazine. Judge Dredd: On The Chief Judge’s Service – Once again Dredd faces the highly trained vigilante assassin known as the Justice Killer, but this time the target is Dredd himself! Created by the writer/artist team of John Wagner and Colin MacNeil, who produced legendary Dredd stories such as ‘Chopper’ and ‘America’. Anderson, PSI Division – Cassandra Anderson, of the Justice Department’s psychic division goes on the trail of the richest man in the solar system, whose psyche is made up of seven composite minds. Story by Alan Grant and art by Arthur Ranson. Written by John Tomlinson, with art by Colin Wilson. Tales of Teleguuth – City-wide carnage, a double dose of weirdness and a nasty sting in the tail ensue in another classic dark fantasy tale written by Steve Moore and drawn by Siku.